The Republic of Indonesia has become the first country in the world to share Vessel Monitoring System (VMS) data for all Indonesian flagged fishing vessels in a publicly-available data platform, Global Fishing Watch (GFW). GFW is a transparency tool allows users to monitor when and where commercial fishing is occurring around the world. Google is among the founding partners of GFW and funding partners include the Leonardo DiCaprio Foundation and Bloomberg Philanthropies. Indonesia is the second largest wild-captured seafood producer in the world. Minister of Marine Affairs and Fisheries for the Republic of Indonesia, Susi Pudjiastuti, called on all coastal nations to follow Indonesia’s example. Peru has pledged to join in. GFW will process and publish VMS data from any nation committed to taking this step toward transparency in what the press release describes as one of the most opaque sectors of the global economy. The lack of transparency in the fishing industry hinders informed resource management decisions. It has resulted in rampant Illegal, Unreported and Unregulated (IUU) fishing which undermines sustainable management. It impacts food security (according to the press release states over 3.1 billion people worldwide rely on seafood for almost 20% of their average per-capita intake of animal protein) and directly affects the global economy. The opaque nature of commercial fishing encourages the proliferation of other associated illegal activities such as drug and human trafficking and use of slave labour. Until now, Global Fishing Watch relied exclusively on openly broadcast Automatic Identification System (AIS) signals from ships at sea to identify and map fishing activity. AIS is a maritime navigation safety communications system standardised by the International Telecommunication Union (ITU) and adopted by the International Maritime Organization (IMO). Originally designed as a collision avoidance tool, AIS provides vessel information, including the vessel’s identity, type, position, course, speed, navigational status and other safety-related information automatically to appropriately equipped shore stations, other ships and aircraft. GFW analyses general patterns of vessel behavior, using artificial intelligence and cloud computing, to identify and display commercial fishing activity through their web-based interactive data-mapping platform. However, there are limitations and challenges to the use of AIS signals. In areas of high vessel density signal interference can cause drop-outs in coverage. VMS, which was designed specifically for use by governments to monitor and track vessels, and is required by all nations, provides more consistent and reliable coverage than AIS. Moreover, AIS can be used to track only industrial-sized commercial fishing vessels, those with a capacity exceeding 100 gross tons, averaging around 24 meters. A large portion of the world’s fishing is conducted by vessels smaller than that. Many of these are not required to carry AIS, and therefore are not publicly trackable. These smaller vessels can be tracked using VMS data, as those are often required to have VMS. Indonesian regulations require VMS on fishing vessels exceeding 30 Gross Tons (averaging about 16 meters or more) that are licensed to fish in their waters. 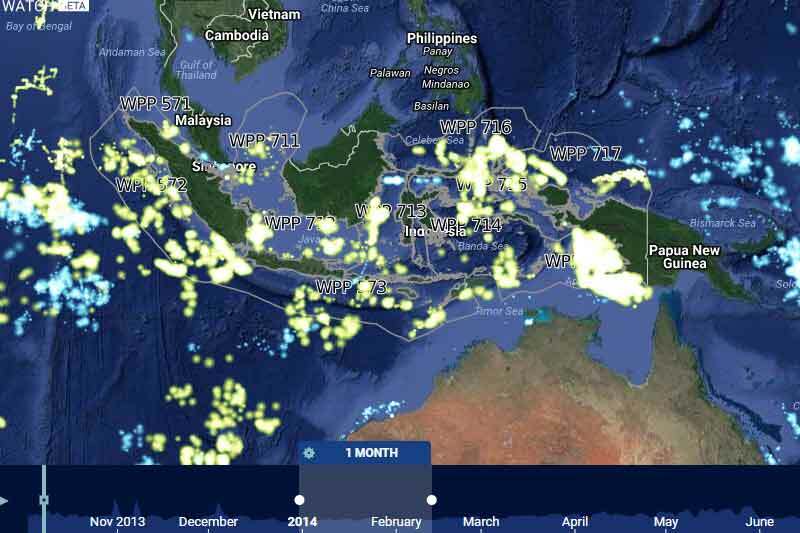 The addition of Indonesia’s VMS data to the GFW platform makes nearly 5,000 previously invisible fishing vessels viewable on the GFW’s heat map. It reveals commercial fishing in vast areas of the ocean where it had previously been invisible. The VMS data is owned by the respective governments that collect it. Indonesia is now the first country to open up that data. GFW has been processing and analysing Indonesian VMS data from 2014 to the present, using the algorithms developed for AIS technology. It will continue to receive newly created Indonesian VMS Data daily. Fish hunt, breed and migrate through the waters of multiple nations. Fleets harvest from exclusive economic zones thousands of miles from their home port. This makes international cooperation and trans-border collaboration a necessity for effective and sustainable management of fishing fleets and ocean resources. Transparency through the public exchange of VMS data would not only assist countries in better monitoring their territorial waters, but also facilitate cooperative regional surveillance and enforcement. Citizens and the media would be able to hold their leaders accountable for long-term sustainability. Increased transparency would also help by improving management decisions and strategies, and providing market benefits to seafood suppliers through validation of product source.